The hyperbole of publishers’ back-page blurbs is deserving of a critical review section in itself. UQP are in fluent overdrive here, proclaiming this debut collection to be: exceptional, luminous, dazzling, extraordinarily forceful & ruled by a gentle but masterly technique. As a critical (& slightly cynical) reader i’m now anticipating one of two things: A work of astonishing genius or the disappointment of yet another over-egged or over-hyped pudding. I’m happy to say that this slim collection veers cautiously toward the former but does on occasion take recourse in the latter. Ultimately though it left me more hopeful than disappointed & to someone who scans as much contemporary poetry as i do, that counts as a notably good result. To be fair to the UQP marketing department, there are many moments within the covers when the writing, or phrasing within the writing, more than lives up to its hype. Powell has a deft eye & ear for intimacy & vulnerability, & a strong, sensual , poetic vision of landscape & situation. Although in this reader’s opinion, he is better at documenting intimate moments or poetic ‘flash fictions’ than he is at maintaining more extended narrative. In Dip, the book’s second poem, we encounter the protagonist’s seeming reticence to allow himself to be poetic, to trust in the validity of his ‘felt’ language & not let it be domineered by the language of ‘thought’. Not shot his mouth off. Perhaps this is a clue to the niggling demon which haunts some of Powell’s work in this collection, a confidence to trust in the economy (& obliqueness) of his own poetic language. There’s a lack of thrift sometimes, a prosaic intruder which infiltrates his phrasing, which is frustrating knowing how well he can condense & control. He needs to trust in his undoubted skill as a poet more, be confident & within that confidence, extend the parameters of his world & the ruthlessness of his economy. Despite the pan-continental back-drops these are insular poems, inward looking poems from his own ‘little window’. They can occasionally feel slightly devoid of a ‘punctum’, nice vignettes but surprisingly empty of emotionality but when he writes well, the poems dance & the moments are well & truly nailed. My only other minor criticism is that it sometimes it feels as though ‘The Poet’ is a little too present, too pre-occupied with being a poet, whatever that actually means. Powell is at his best when the language feels instinctive, honest & not overly wrought. Late Winter is a truly beautiful little poem, my favourite in the collection – it marries the minutiae of domestic detail with the vastness of an external natural almost metaphysical presence; it’s beautifully observed & is one poem handled with an incredible degree of economy. 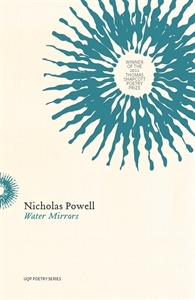 Water Mirrors is inarguably a strong debut for which Nicholas Powell should be applauded, but it is, for me anyhow, glowing with promise rather than dazzling; it is generally strong but not exceptional. What Powell gives us with this offering of 42 poems is a taster-plate full of possibilities. I look forward to reconvening for the next sitting; I’d be backing him to get better & better. Paul Summers is a northumbrian poet who lives in Central Queensland. his poems have appeared widely in print for over two decades and has performed his work all over the world. A founding co-editor of the ‘leftfield’ UK magazines billy liar and liar republic, he has also written for tv, film, radio, theatre and collaborated many times with artists and musicians on mixed-media projects and public art. This entry was posted in Issue 7, Paul Summers, UQP, Water Mirrors and tagged Australian Literature, Australian poetry, australian poets, literature by Mark Roberts. Bookmark the permalink.